NAVIGATOR SERIES CUSTOM UPWIND CRUISING SAILS BY ULLMAN SAILS The Navigator Series offers cruising sailors affordable, durable sails for day sailing and coastal cruising. 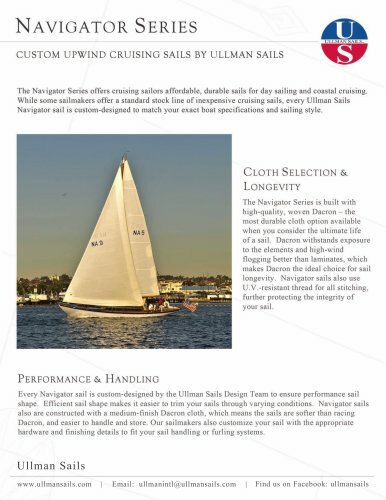 While some sailmakers offer a standard stock line of inexpensive cruising sails, every Ullman Sails Navigator sail is custom-designed to match your exact boat specifications and sailing style. CLOTH SELECTION & The Navigator Series is built with high-quality, woven Dacron-the most durable cloth option available when you consider the ultimate life of a sail. Dacron withstands exposure flogging better than laminates, which makes Dacron the ideal choice for sail longevity. Navigator sails also use U.V.-resistant thread for all stitching, further protecting the integrity of your sail. PERFORMANCE & HANDLING Every Navigator sail is custom-designed by the Ullman Sails Design Team to ensure performance sail shape. Efficient sail shape makes it easier to trim your sails through varying conditions. Navigator sails also are constructed with a medium-finish Dacron cloth, which means the sails are softer than racing Dacron, and easier to handle and store. Our sailmakers also customize your sail with the appropriate hardware and finishing details to fit your sail handling or furling systems.